Breast Cancer Help’s clothing bin recycling program makes it easy for many to join in the fight against cancer, while helping to preserve the environment. Through a unique partnership with Earthrite Textile Recycling, Inc., large, pink clothing collection bins have been placed throughout Long Island. Members of the community can drop off their used or unwanted clothing at designated drop off locations. Clothing is collected through continuous weekly pick-ups. Proceeds from the sale of the clothing benefit Breast Cancer Help, Inc. to support its programs and mission. To date, the clothing recycling program has raised over $1,000,000 to benefit Breast Cancer Help, Inc.
Raising funds to support the organization’s programs. Where can I drop off my slightly used and unwanted clothing? 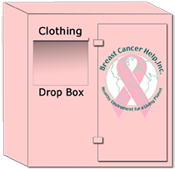 Breast Cancer Help, Inc. welcomes additional locations to place our clothing bins. If you are the owner of a location and would like to assist us, please call Earthrite Textiles at (631) 580-7092.